To complement the modules and mounting frames, there is a range of accessories for testing, accessing, disconnecting and protecting circuits wired through Krone modules. All termination of wires on Krone connectors must be carried out using a special tool. The tool applies the correct pressure to both wire and contact and trims the excess wire off at the same time. The cutting action of the tool can be prevented and a hook is included on the tool for removal of wires from modules. Disposable non-impact plastic tool for up to 100 terminations. Designation strips 51A are double sided hinged label holders which clip over 237 or ABS modules. Circuits and jumpers can be accessed without removing the label holder permitting easy reference to circuits under test. 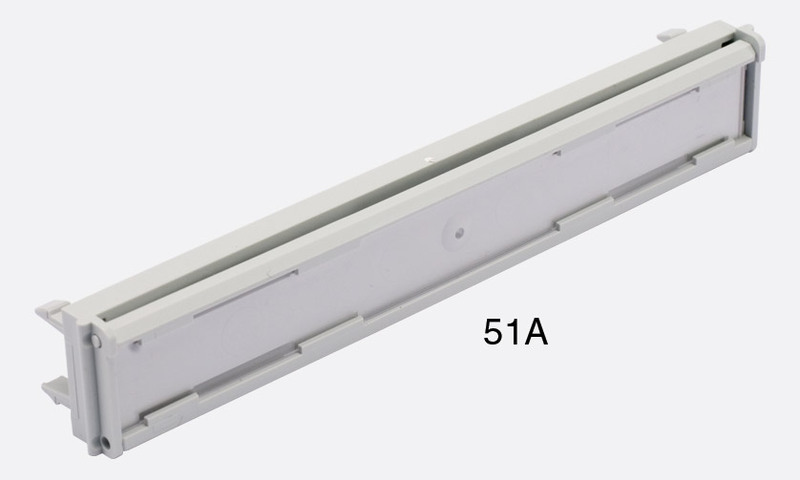 Paper inserts to suit the 51A are also available, supplied in packs of 100. Module size designation strip 53A. The larger designation strips 53A are intended for fitting in place of a module on a frame. These are non-reversible but are constructed of a thicker gauge plastic allowing them also to be used as a base for various custom connection applications or test sockets (eg 4mm terminal posts or other connectors). For temporary circuit disconnection (testing, or installation of parallel wiring), small dis-pegs 23A can be used. Each peg locks into place and forces the connection contacts apart of a single pair on a 237A or ABS module. Where many pairs need to be connected (normalled) simultaneously, the dis-pegs can be joined with string and then pulled out together to turn a system ‘live’. Up to 10 circuits can be disconnected simultaneously on a module, with dis-peg type 25A. The 25A can be modified by cutting out any ‘teeth’ that are not required to make a custom dis-peg, used for example to break only groups of associated circuits, controls and dc’s. Push-on number markers for modules. Supplied in strips of 10 markers, either 0 - 9 or 10 - 100 (10, 20, 30 etc). 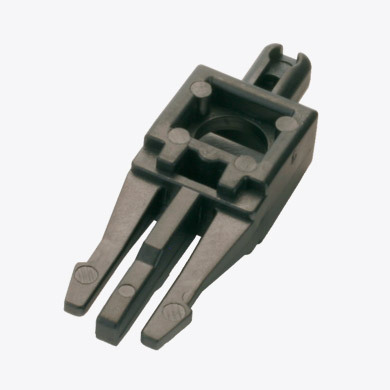 The wall connection boxes 250 and 301 accept a range of push fit accessories for cable ties and jumper cable routing. Fixing 1B is a screw or bolt fit cable tie anchor. Jumper ring 500 is a screw fitted split metal jumper ring which can be used on 19” module frames and in other applications.